A few weeks ago I cut a big old white 'Welcome' vinyl decal for a door only to realize it wasn't going to work because our back door is white. DUH! Instead of throwing out that much vinyl and instead of painting my door, I decided to try to salvage the cut with some spray paint. Seriously I owe spray paint a lot of credit for the number of times it's saved me! This was a whole lot of trial and error and I really wasn't sure if it was going to work...there were several points through the process where I was sure it wasn't going to, actually. But I can tell you it did and I'm happy to be the guinea pig - so whether you messed up and cut on the wrong color vinyl or you just need a custom color vinyl that you can't find or don't want to buy a sheet of vinyl in a color you'll only use once - spray paint to the rescue. I cut on matte white and it covered nicely with just one coat of spray paint. I'm not sure how a dark color vinyl would cover so if you have the option and you have white on hand that would be my suggestion. Cut the vinyl and then weed it like you normally would. Grab your spray paint and your vinyl (still on the backing) and head outside. Spray a nice even coat all over the vinyl. Spray the lightest coat possibly while still fully covering the vinyl. Now wait. Wait for at least 24 hours for the spray paint to dry. When it's complete dry lay your transfer tape onto the vinyl to pick up the design. Use the Silhouette Scraper to burnish the design onto the tape. Here is when I thought it wasn't going to work....when I started to peel the tape away from the backing all of the spray paint, even that on the backing came with it. 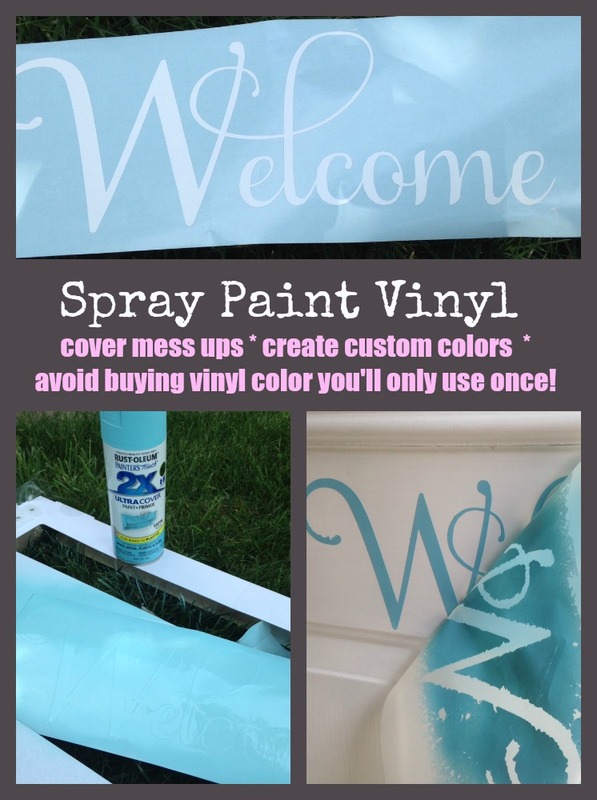 You may have to encourage the vinyl to come off the backing in some areas because the paint has dried over the edges of the vinyl onto the backing so it doesn't lift quite as easily. And much to my surprise the tape and all the excess paint peeled away easily while the spray painted vinyl stayed just where I wanted it on the door. There are a few little areas of paint chips on the edges (ie around the bottom swoosh on the W), but you can just use your finger to kind of flick them away to get that nice clean edge. You know what I love? Well, besides all the cool and informative things you put on Silhouette School? That you tell us when you cut a white piece of vinyl for a white door! Sometimes I feel like I'm the only one who does those things. Disappointment galore a couple weeks ago when I weeded the wrong part of the vinyl!! Ugh. But that piece is safe and sound for another sign. :-) Thanks for your blog. I used this same concept back in June of thisyear. Our VBS sign needed a time change, but my church didn't want to pay to replace 9 characters (you wouldn't believe the quoted price). I used contact paper & a twee bit of rubber cement to adhere the numbers/symbols to the vinyl banner. I spray painted it dark purple using a Krylon plastic paint. It wasn't an exact match, but very close. Now, I don't buy colored vinyl. I make my own. Trying the metallic paint for a wall monogram for my daughter next. Cross your fingers! I am a vinyl newbie. I have been trying to make subway type art. I can never do different colors because I can't line the design up correctly. Some phrases are always just a wee bit crooked. This gives me the idea to do it all in white, therefore keeping design together and then spray painting certain phrases. Yay! Can't wait to try it on my next project. I've spray painted sheets of vinyl before that I didn't really like or if I needed a custom color. then waited for it to dry and then cut that in the machine and it's always worked great. thanks for the reminder that this is a possibility! 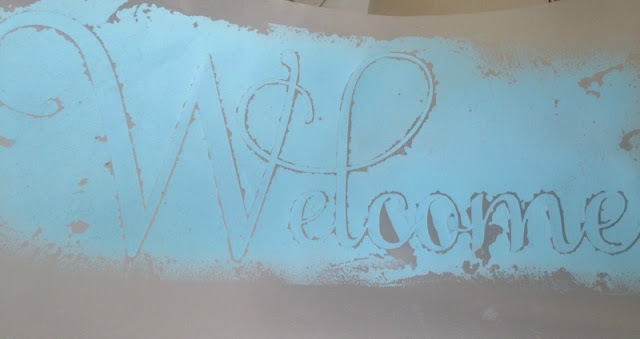 Would it be easier to spray the vinyl first then cut out with Silhouette when properly dry ? Is this still holding up okay? i think it would depend on how much use the letters get. i put lettering on my storm door for every occasion, even in the dead of winter. it does fine through rain, snow, freezing temperatures. i also made labels for my canisters and my grand children's art supply and toy totes and they've held up great. 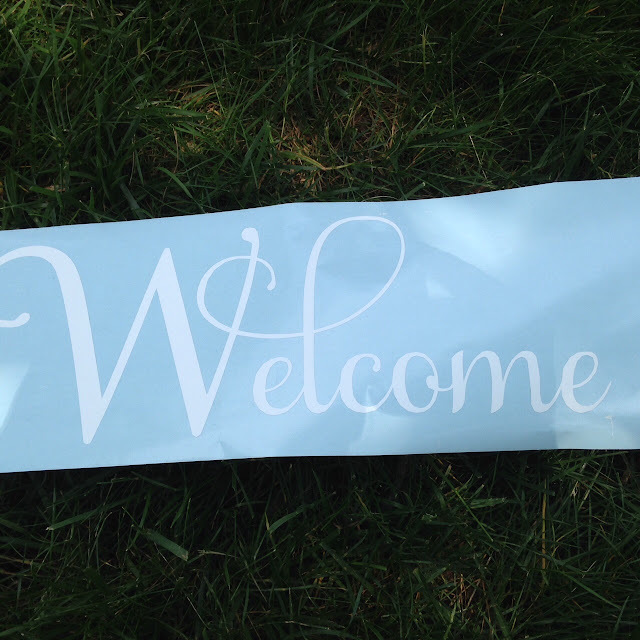 i have also made exterior signs using contact paper for stencils and the paint doesn't hold up as well as the spray painted contact paper. i paint contact paper all the time! i did a great design last fall-- i put it on the glass of my storm door-- and sprayed the lettering and the leaves both school bus yellow and rusty orange. the over spray made them look shaded-- and custom. got tons of nice comments. i've also found if you have ragged edges, run a tooth pick around the edge and it comes right off for a clean look. i pick up basic paint colors at walmart (they have the best prices) and lowe's valspar brand for the great designer shades. i keep them in a clear tote to see the cap colors at a glance. metallic paints make great labels, too. hope this helps someone else.